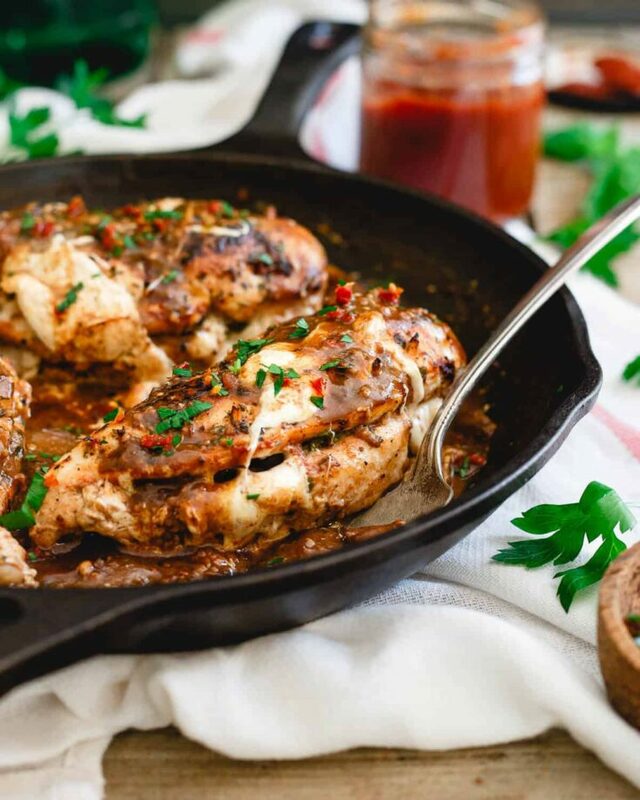 This stuffed chicken marsala is an even more delicious twist on the classic Italian dish with melted mozzarella, sweet and savory tomato butter and fresh basil cooked inside the chicken. Saturday is our 11 year anniversary. ELEVEN. Crazy. I was recently looking back at our wedding photos trying to salvage a few for some frames in our newly redecorated bedroom (and I say salvage because our wedding photos are so badly done, like so so bad. Now that I know how to take real photographs I’m floored our photographer had a legit business – long story on how and why he shot our wedding that I won’t get into…) and I don’t even know who that baby-faced 24 year old was. In my head I haven’t changed in the past 11 years but looking at those pictures and the honeymoon ones in the same folder on my external drive have me realizing I have. Thankfully, it’s mostly for the better. I was frumpy AF and a lot chunkier than I ever remember being but bikini pictures in Tahiti are telling me otherwise. *This post for Stuffed Chicken Marsala is sponsored by partner, Nuts.com using their tomato butter. All content and opinions are my own. 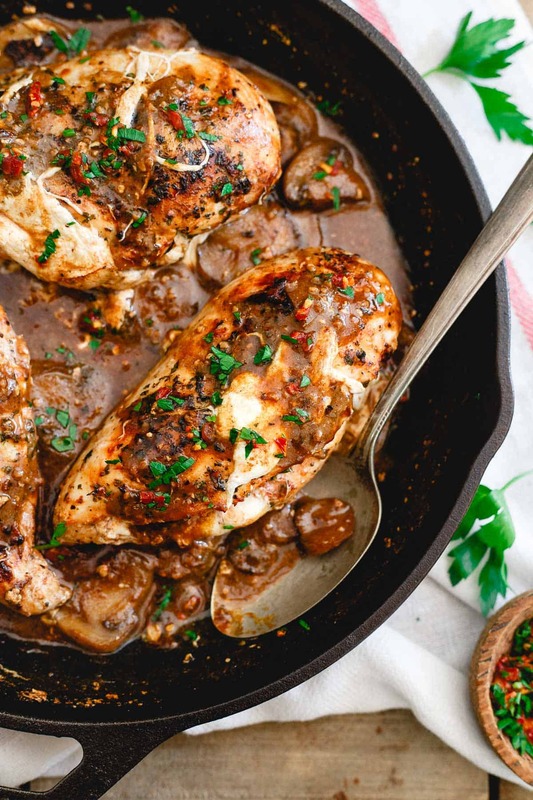 When the idea to make this stuffed chicken marsala came to me, I was instantly taken back to that first year of marriage in our house in Florida. This is totally a recipe I would’ve made back then. I was a Food Network, Giada obsessed newlywed who printed one of her recipes off the internet at least 5 times a week to make for my new husband. I followed directions verbatim and bought obscure ingredients when called for. It’s a far cry from who I’ve morphed into today in the kitchen but my love for food and cooking remain unchanged. This is a recipe I can see Giada having totally made back in the day on one of her tv shows. 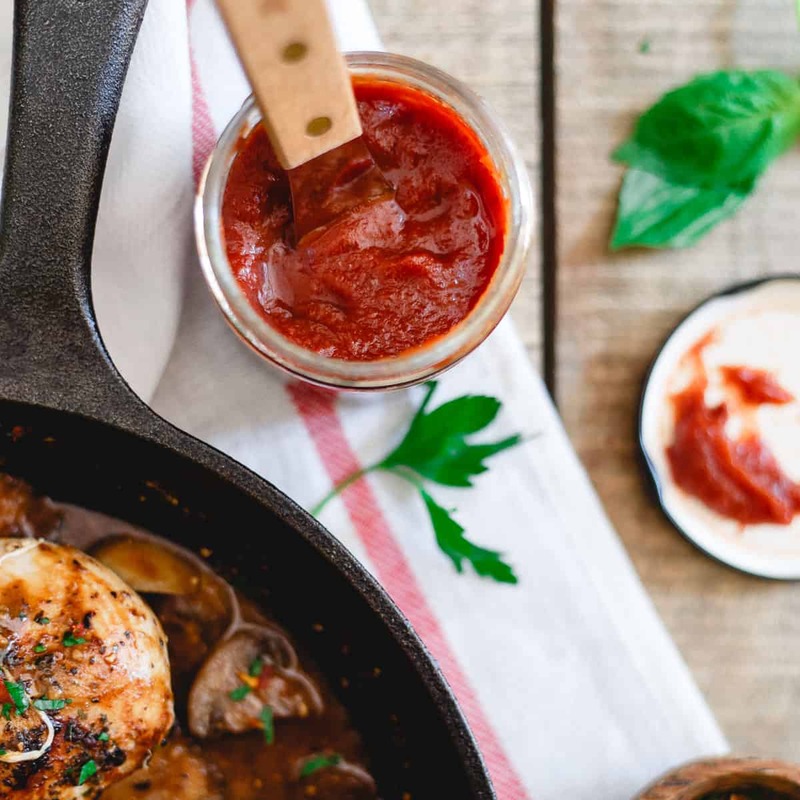 It’s classic Italian (have you ever not seen chicken marsala on an Italian menu?) but it’s got a little modern twist to it with the use of tomato butter. I was really excited to try out this tomato butter from Nuts.com. Part tomato, part apple butter it’s like the perfect transitional ingredient from summer to fall. A bit savory, a bit sweet, I totally love it on something as simple as toast to something as complex as this stuffed chicken marsala. For as “Italian” as I am, I hardly ever make the traditional kinds of Italian dishes you’d see on any Italian American restaurant menu at home but with this tomato butter twist, some (good) fresh mozzarella and the last of my summer basil, I think that might have to change because hot damn, this stuffed chicken marsala was a gooooood dinner. I love how the thick and savory marsala mushroom sauce is perfectly offset by the freshness of the ingredients stuffed into the chicken. It’s decadent and traditional while updated and modern at the same time and it totally explains why 24 year old newlywed me was just a taaaaad bit heavier than I probably should’ve been, eating things like this 5 times a week. Slice each chicken breast so that you butterfly the breast, creating a pocket for stuffing, do not slice all the way through. Season the inside of the chicken with salt and pepper. Spread tomato butter on the inside flesh, top with mozzarella slices, fresh basil and a little more tomato butter. Close the chicken up and secure with toothpicks around the entire opening (*see note for method). Repeat with remaining chicken breasts. Once sealed, season the tops of each chicken breast with more salt and pepper as well as the dried basil and parsley. Place the oil in a cast iron skillet over medium-high heat. Once hot, add the chicken to the skillet and cook for about 3 minutes on each side until browned. Remove the chicken from the skillet and set aside on a plate. To the same skillet, add the garlic, chicken broth, wine and milk. Whisk together until combined. Add the mushrooms, stir gently. Bring the mixture to a boil then reduce heat and let simmer for about 5 minutes. Return the chicken to the pan, spoon some of the liquid on top of the chicken then transfer to the oven and cook for 20 minutes until chicken is cooked through and sauce is reduced and thickened. -I break the toothpicks in half so that they're not too long and don't get in the way while cooking. Place toothpicks pretty close together so that the cheese and tomato butter don't seep out while cooking. -If you want a thicker sauce, remove chicken breasts to a plate once out of the oven and cover with foil to keep warm. Place the skillet on the stove-top over medium-high heat and cook until sauce is reduced and thickened (about 5 minutes). Return chicken to the skillet right before serving and spoon the sauce over the top. Stuffed with so much awesomeness!! I love how vibrant this is! The flavors sound wonderful. Tomato butter sounds so amazing!! This dish is calling to my name! I LOVE these photos! And this chicken. I always need new chicken ideas and this is happening! 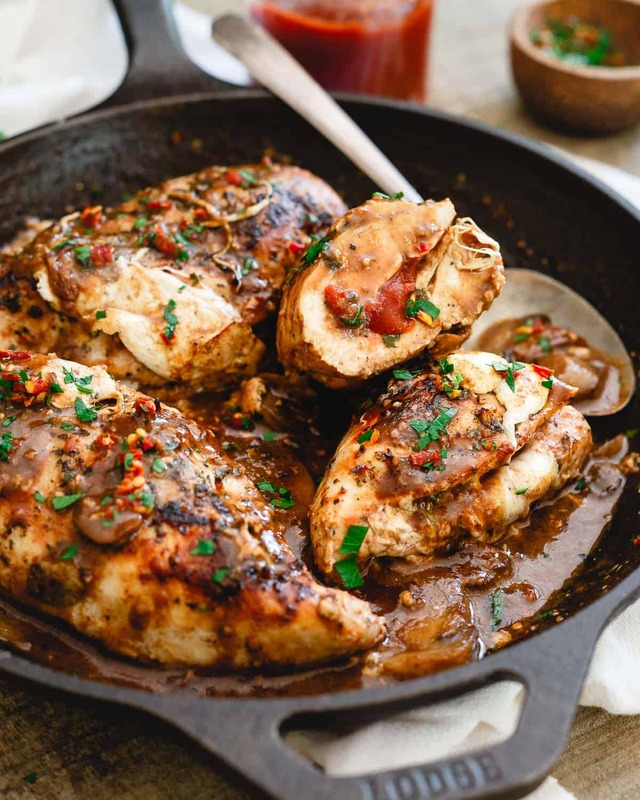 I love chicken marsala and this stuffed version looks phenomenal!!! 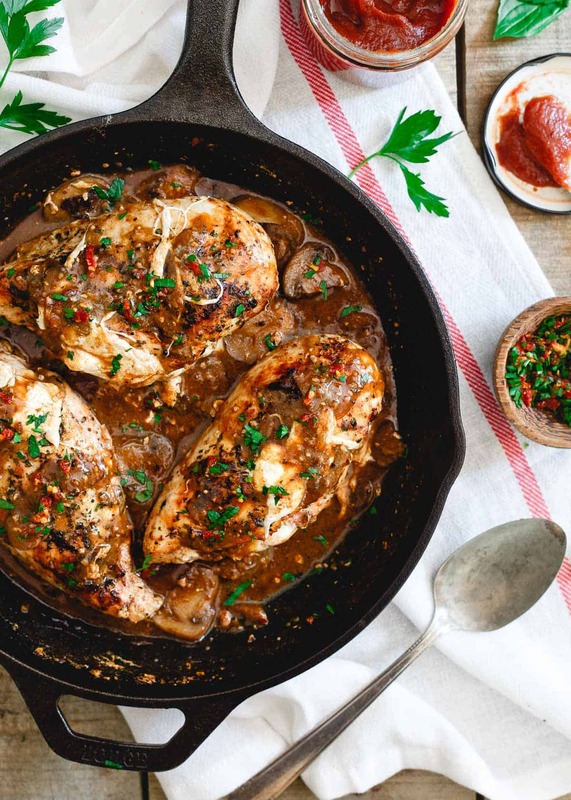 We love chicken marsala, so I know will love this amped up version Gina! Looks delicious! This looks amazing!! Really kicking the classic up a notch. Congrats on your anniversary! Oh my GOD this is absolutely drool worthy! That tomato butter sounds divine! I’m still trying to get my mind wrapped around these awesome flavors!! Gorgeous Gina! What is tomato butter? Where would I find it?